PORTLAND, Ore. — An hour-long panel discussion at Portland State University followed the March 4 screening of In the Name of Confucius, a 2016 documentary about the Chinese government-run and funded language programs that are named for the ancient teacher and philosopher. Scores of people attended the afternoon event in the university’s Urban Center, where four panelists weighed in on the controversies surrounding the Confucius Institutes (CI), as well as the pending renewal of a 5-year contract for the local CI chapter at PSU. Since 2004, over 1,600 Confucius Institutes and related Confucius Classrooms have been set up in colleges and schools around the world, representing at least US$2 billion in investments from the Chinese state. While Confucius Institutes are presented as a benign facilitation of cultural exchange, activists, security agencies, and experts believe that the program helps the Chinese Communist Party (CCP) extend its political censorship and undermine academic freedom in democratic countries. Confucius Institutes forbid their teachers from talking about topics the CCP deems sensitive or unflattering, such as the issues of ethnic and religious human rights, the political status of Taiwan, or the 1989 June 4 Massacre at Tiananmen. In the Name of Confucius, released in 2016, tracks the ideological agenda and financial influence associated with the Confucius Institutes through a collection of interviews and on-the-scene footage at protests and meetings. The documentary follows the story of Sonia Zhao, a Mandarin teacher who, upon completing her training in China and prior to leaving for work in Canada, was compelled to sign a contract that discriminated against her faith in Falun Gong, a spiritual practice that is banned and persecuted by the CCP. It also shows the process by which the world’s largest CI was shut down in Toronto. Zhao eventually defected to Canada and filed a complaint that, in 2013, resulted in the termination of the Confucius Institute at Ontario’s McMaster University where she was employed. The panelists at the PSU screening, expanding on the themes featured in the documentary, cited multiple concerns with the way Confucius Institutes are operated, as well as the Chinese government’s motives in their worldwide promotion. On the panel were Doris Liu, the Chinese-Canadian director of In the Name of Confucius, PSU film professor Jennifer Ruth, Tibetan human rights activist Dorjee Tseten, and Rachelle Peterson, research director of the National Association of Scholars (NAS). Rachelle Peterson, who authored the 2017 study Outsourced to China: Confucius Institutes and Soft Power in American Higher Education, investigated 12 Confucius Institutes across the United States and came to what she said were similar conclusions as the documentary. “Academic freedom is compromised” when local schools accept funding to set up CIs, she said. Jennifer Ruth, who has worked at PSU for 20 years and is a member of the American Association of University Professors (AAUP), said that it is very difficult for host schools to accept Chinese money for the Confucius Institutes and also guarantee academic freedom, as the financial incentive creates powerful conflicts of interest. “Once the money’s there, it’s extremely hard to take it away,” she said. Dorjee Tseten, executive director of Students for Free Tibet, spoke about how expanding Chinese influence in Western academia was effective in putting pressure on Tibetan activists. He cited examples of how the Dalai Lama, the leader of Tibetan Buddhism, was barred from giving speeches at universities due to Beijing’s threats that it cut off funding for Confucius Institutes. Tibetans are one of China’s most persecuted minorities, with their religion and culture being under close control by the CCP since it annexed Tibet in 1950. The Chinese authorities label all attempts by Tibetans in and outside the autonomous region to agitate for their rights as “separatism.” Many Tibetans, like Tseten, were born in refugee camps outside China. 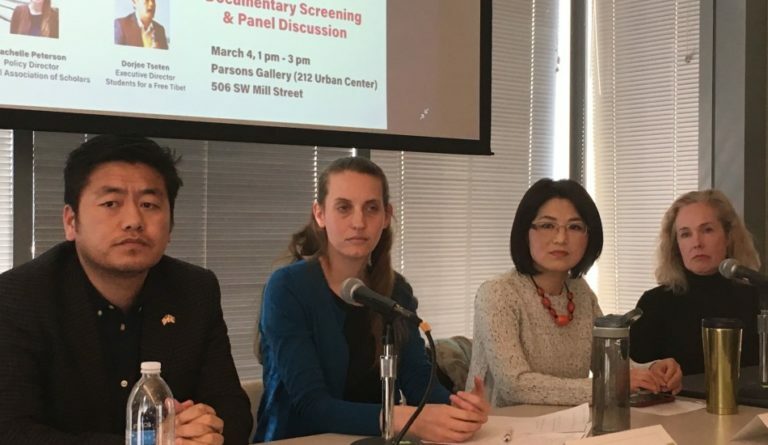 Yu Xiao, a Chinese-American professor of urban planning who hosted the March 4 screening, said she had invited the Confucius Institute to join, but received no response. Confucius Institutes are staffed and directed by the Chinese government’s Office of Chinese Language Council International, abbreviated in Mandarin as Hanban. Doris Liu, adding to Peterson’s comments, pointed out that the Hanban was under the direct control of the Chinese central authorities. “Above Hanban there is a council, and the head of the council is the current vice-premier of the People’s Republic of China,” she said, referring to Liu Yandong, who is also a member of the 25-strong CCP Politburo and a former head of the United Front Work Department (UWFD). The UFWD was founded in the early years of the Chinese communist movement and played a strong role in subverting the Nationalist Chinese government before the CCP seized victory in the civil war in 1949. United Front work continues today, both inside Chinese society and abroad. According to Peterson, CIs are part of the modern united front efforts to establish influence abroad and legitimize Beijing’s authoritarian power. “The Chinese government works in a way to build relationships, to encourage people to have friendly feelings toward China, and one of the main priorities of the Chinese Communist Party’s United Front Work Department is to make the foreign serve China,” she said. Peterson noted that there has been a shift in attitude in recent years to the Confucius Institutes, or a “waking up to China’s subtle aggression.” Combatting the CCP’s soft power and roundabout censorship has become a bipartisan issue, particularly under the Trump administration. The report also recommended that Congress require U.S. academic institutions to publish all their contracts with foreign governments, which would include agreements for Confucius Institutes. At PSU, Ruth said that more efforts are being made to take the Confucius Institute and the university administration to task. The current 5-year contract for the CIPSU expired on February 5, and a resolution was passed by the PSU Faculty Senate to recommend that no new contract be made unless the language was changed to give the school more control over hiring and academic freedom. “It would have to turn into something that I don’t think the [Communist] Party would be comfortable with,” she said. Peterson said that even if language was introduced to the written contracts to protect academic freedoms, it would be in practice difficult to ensure that Hanban would keep up its end of the deal. “It’s pending right now, we’ll see,” said Ruth.